MZ-Store Whey Protein (WPI+WPC) is a unique blend of whey protein isolate and whey protein concentrate in a perfectly soluble instantized form. This supplement allows quick replenishment of diet with a rapidly digestible protein, in the form of a delicious shake available in 6 extraordinary flavors. Protein is a key macronutrient for people whose muscles are subjected to high loads. In contrast to fats and carbohydrates, the main task of proteins is not to provide energy, but to create and rebuild body tissues. For this reason, every person who exposes their body to the effort leading to micro-damage of muscle tissue should ensure a high dose of amino acids derived from good quality proteins. This is necessary for the regeneration processes to occur at a satisfactory pace, which invariably leads to progress. The quality of protein is equally important as the amount of protein supplied in a diet because not all amino acids can be used to build human tissues. Hence, the Biological Value (BV) parameter was created to make it possible to compare the quality of particular proteins. The parameter compares to what extent the amino acid profile of a given protein coincides with the egg protein, which is considered the best for the construction of human tissues. Another determinant of protein quality may be the content of BCAAs, or branched chain amino acids, which have a significant influence on the synthesis of muscle proteins. Whey protein concentrate (WPC) – it is a type of whey protein that belongs to the most commonly used dietary supplements among athletes. It is a convenient form to be used for complementing the menu with high-quality proteins, with a tiny addition of carbohydrates and fat, while maintaining a reasonable price. The whey protein concentrate starts absorption after about 30 minutes and lasts for almost 2 hours, which perfectly covers the time of increased absorption of macronutrients which occurs following the completion of a workout. The slightly prolonged absorption time of WPC, compared to isolate, is an unquestionable benefit in the reduction of body weight. The supplement ensures the presence of amino acids in the blood for longer, thus reducing the intensity of catabolic processes, which in turn results in a reduced risk of muscle loss. In addition, slower release kinetics means that there are no sudden attacks of hunger after eating a supplement. It is also worth paying attention to the high BV value, which is about 100, and the good amino acid profile offered by WPC. Both of these parameters guarantee that the supplied amino acids will do well as a building block for muscle tissue. Whey protein isolate (WPI) – a fraction considered to be the most perfect and purest of whey proteins. It is obtained through the process of microfiltration of whey protein, which removes not only all impurities, but also milk fat particles and lactose. The raw material obtained in this way has dry matter content of protein up to 95%, further abounding with valuable BCAA amino acids (leucine, valine and isoleucine). These proteins, and in particular leucine, promote the synthesis of muscle proteins by stimulation of kinases. This means that their high supply may positively affect the growth of the athlete's muscle mass and the more effective regeneration of muscle tissue. In addition, the WPI is characterized by an extremely high bioavailability, which is confirmed by the BV parameter of over 150. The absorption rate of amino acids from this protein fraction is also one of the fastest, which makes this preparation to work well right after a workout or waking up when the body needs a rapid surge of protein. The preparation belongs to the Muscle-Zone product line. These products are manufactured with the utmost care to ensure that they meet all expectations of customers. For this reason, both the solubility and the taste are at the highest level, whereas the packaging in the form of a can ensures freshness of the products. The supplement offered comes in 6 attractive, original flavors. The manufacturer additionally made sure that the lovers of supplements with a natural taste could also find something for themselves. 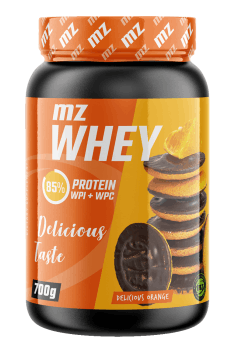 To sum up, MZ-Store Whey Protein (WPI+WPC) is a product intended for athletes expecting high-quality protein supplement with immediate absorption, which will easily and quickly enable them to increase the amount of protein in their diet. This supplement supports the development of muscle mass and accelerates the regeneration of the body while giving a great opportunity to diversify your diet. 1 scoop (25 g) mix in 250-300 ml of water. Consume 1-2 times a day, depending on demand. Administration of the supplement before or after a workout favorably affects regeneration and, owing to the high content of leucine, it can also reduce drowsiness during training. This product is ideally suited as an addition to various types of shakes, omeletes or thick toppings. It can be successfully mixed with either water, milk or vegetable drinks. Natural Ingredients: whey protein isolate, whey protein concentrate. Birthday chocolate Ingredients: whey protein isolate, whey protein concentrate, aroma relevant to flavor, cocoa, modified celulose, sucralose, sodium cyclamate, sodium saccharin. Delicious orange Ingredients: whey protein isolate, whey protein concentrate, aroma relevant to flavor, cocoa, modified celulose, sucralose, sodium cyclamate, sodium saccharin. Summertime vanilla Ingredients: whey protein isolate, whey protein concentrate, aroma relevant to flavor, modified celulose, sucralose, sodium cyclamate, sodium saccharin. American cherry cheesecake Ingredients: whey protein isolate, whey protein concentrate, aroma relevant to flavor, modified celulose, sucralose, sodium cyclamate, sodium saccharin, betanin. French caramel Ingredients: whey protein isolate, whey protein concentrate, aroma relevant to flavor, sodium chloride, modified celulose, sucralose, sodium cyclamate, sodium saccharin. Completely natural boost in growth hormone levels. Promotes post-workout recovery. A multi-ingredient dietary supplement, which effectively supports the health of joints and connective tissue.